Home to hundreds of faults, California leads the nation in frequency of earthquakes every year. Despite enduring their share of the natural disasters, residents still speculate over the inevitable big one. More than three thousand people lost their lives during the 1906 San Francisco earthquake. Long Beach’s 1933 earthquake caused a loss of nearly $50 million in damages. And the Northridge earthquake injured thousands and left a $550 million economic hit. 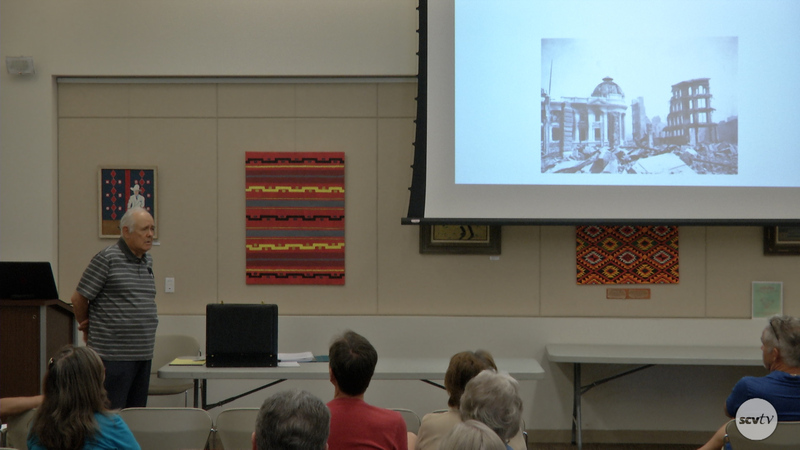 The Santa Clarita Valley Historical Society presented Historian Abraham Hoffman as he explores the personal accounts and aftermath of California’s most destructive tremors. Dr. Abraham Hoffman was born in Los Angeles and attended Los Angeles City College and received B.A. and M.A. degrees from Los Angeles State College (now California State University, Los Angeles). He earned his doctorate in History at UCLA. Dr. Hoffman taught in Los Angeles schools for more than thirty years and has also been an adjunct professor at Los Angeles Valley College since 1974. He serves on the board of editors for Southern California Quarterly, reviews books, and contributes articles to history publications. His books include “Unwanted Mexican Americans in the Great Depression: Repatriation Pressures, 1929-1939“, “Vision or Villainy: Origins of the Owens Valley-Los Angeles Water Controversy” and “Mono Lake: From Dead Sea to Environmental Treasure“. In addition to being a member of the Los Angeles City Historical Society, he is also a member of the Historical Society of Southern California, Organization of American Historians, Western History Association, Western Writers of America, and the Los Angeles Corral of Westerners.